With a stay at Shanghai Waigaoqiao Free Trade Zone Vienna Hotel in Shanghai (Pudong), you'll be a 5-minute drive from Waigaoqiao Free Trade Zone and 8 minutes from Changxing Island. Featured amenities include a business center, a 24-hour front desk, and luggage storage. Free self parking is available onsite. With a stay at Bremen Grand Hotel in Harbin, you'll be close to Wanda Plaza and Heilongjiang Provincial Museum. Located in Shangri-La, Dream House Inn is within a 10-minute drive of Guishan Park and Diqing Museum. A shuttle from the airport to the hotel is provided at no charge. 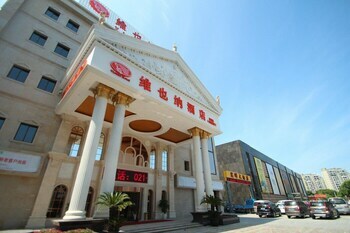 Located in Qingdao (Huangdao), Moli Jinpin Hotel is within a 5-minute drive of Jiashike Huangdao Shopping Center and Botangzhai Art Museum. Free self parking is available onsite. With a stay at Shanghai Swan Hotel in Shanghai (Hong Kou), you'll be within a 15-minute drive of Old Chinese City and Shanghai Circus World. Self parking (subject to charges) is available onsite.